In case you missed it, SEO and content marketing had the wedding of century without us. Awhile ago. BUT, they have an open relationship that works better than other open relationships. 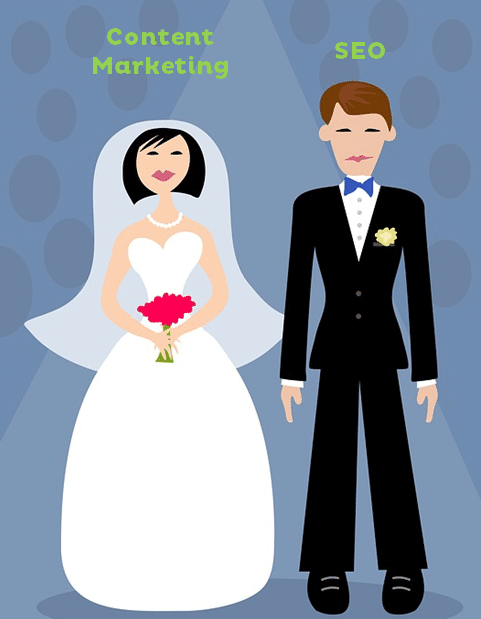 SEO and Content Marketing mawwiage. Mawwiage is what brings us together today. Search engine optimization is a complex marketing strategy with a lot of moving parts. In its simplest form, SEO marketing refers to getting your website ranking in the organic search results on Google, Yahoo, Bing and other search engines. SEO services can’t be done without content. Why? Because you can’t get your website to rank on Google without applying the correct words, phrases, images and video to your website should be ranking for. You can’t have those keywords sprinkled throughout your website without content. Keywords are the little things in marriage that may seem insignificant but are significant to the marriage as a whole. Keywords are “I love yous,” reminding your husband that you appreciate it when puts the dirty dishes in dishwasher instead of leaving them in the sink and peeing on them. When SEO and content marketing have a complementary relationship, they share their favorite words of encouragement (like aluminum cans for sale, las vegas aluminum), solidifying their special bond through proper backlinking (hand holding). SEO marketing and content marketing need each other in order for your business to succeed online. SEO needs content to have some keyword to optimize for the search engines, and content marketing needs SEO because it wants to be read. It wants to be read by the Google bots, Facebook bots and, most importantly, by you, the consumer. Without steamy SEO practices, your content won’t reach the people you want it to reach – the people who are actually searching for the topic your content/business is about. Opposites attract but complementary relationships are made to last. 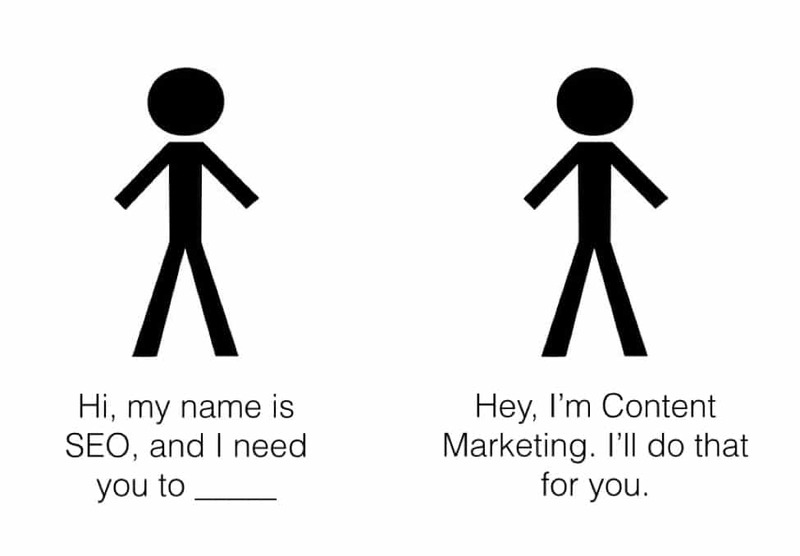 SEO and content marketing complete each other. So what’s the difference? SEO is more technical, focusing on details such as keywords and meta tags. Content marketing is broader, involving a more holistic approach to representing your business online. One without the other is like peanut butter without the jelly, mac and cheese without the cheese, yin without yang, Romeo without Juliet, Tic without Tac, Trick without treat, mittens with no thumbs, a camel without his hump, and many more pairs that we could mention but ran out of. Content marketing fills the demands of good SEO practices, from ensuring your website is optimized with keywords to creating compelling content about your services to engaging your audience with interesting content they want to read. The image below sums this up perfectly. SEO needs content. Why? Content is king, and SEO can’t conquer without a king. Content is king, and SEO can’t conquer the web without it. Here is something to think about, the term SEO appeared in this article more than 38 times. Guess where we’d like it to show up? A good internet marketing strategy will use good SEO practices so Google doesn’t punish your site. Great internet marketing will use good SEO strategy to publish and promote content marketing chalk filled with keywords. The best internet marketing strategy uses both SEO and content marketing together with a social media strategy that engages (see what we did there?) the two. Post Launch does all three. We understand the fundamental love between SEO and content marketing but also know that the best success only comes when creating an open relationship between all of your marketing strategies, including social media and maybe even SEM (paid advertising). Clearly, this relationship works best when they can each spread their wings without getting jealous of others successes because, after all, they are all working together for the success of your business. Contact Post Launch to learn more about local SEO, content marketing, SEM, social media services in Las Vegas and more. Setup a free SEO consultation with us to discuss how we can help your business grow and succeed online.